Cucina Bianca developed in the Ligurian and Maritime Alps and is made of local products of pastoral civilization. 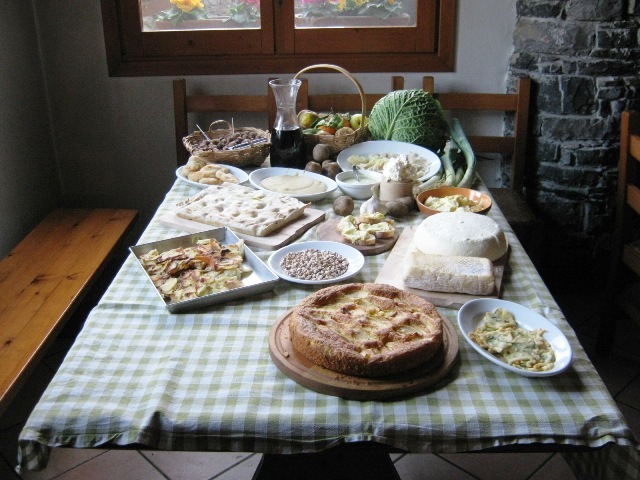 On top of the Ligurian and Maritime Alps, in Cuneo and the Occitane Valley, where people lived of agricultural and pastoral transhumance, developed a unique cuisine called Cucina Bianca. This typical cooking is made of local products of pastoral civilization: flour, potatoes, leeks, turnips, dairy products, and legumes, all ingredients that are easy to find on the high paths traveled along with the flocks. Cucina bianca literally means white cuisine, owing its name to the white color of its dishes and the lack of colors that are so common in the mediterranean cuisine. Lack of colors, though, doesn't mean lack of taste or healthy ingredients. Cucina Bianca is very flavorful and based on quite energizing dishes influenced by Provence and Piedmont's cuisines - so much so that some of the dishes are prepared and called the same way in Tenda (France), in Mendatica (Imperia) and Caprauna (Cuneo). The preparation of the dishes is simple, as these were often made in poorly equipped shelters along the journey, and generally consisted of a single dish, appetizing and energizing, which did not require long periods of preparations. Among the most famous dishes are the sugelli, water and flour dumplings, served with bruss, cream cheese made by fermenting ricotta; streppa and caccia là, a sort of open lasagna, topped with seasonal vegetables; and cheeses such as sheep toma cheese, goat and mixed milk cheese. This is the area of the brigasca sheep breed, which was drammatically decreasing in number until a Slow Food Presidium was established to protect it and to support the production of brigasca sheep's raw milk toma cheese, made in the few remaining pastures along the border between Italy and France. In order to protect the products of the Maritime and Ligurian Alps a road called Strada della Cucina Bianca - Civiltà delle Malghe (Cucina Bianca road - Malga civilization) was constituted, linking the towns of Cosio di Arroscia, Mendatica, Montegrosso Pian Latte, Pornassio, Triora, La Brigue (in the French department of Alpes-Maritimes) and Briga Alta, in the Cuneo District. In addition, Mendatica, every year at the end of August, celebrates the Cucina Bianca Festival, with gastronomic itineraries that flow among the alleyways of the old town. In a similar way, the Expo Valle Arroscia, in its 2nd edition, is devoted to promote the Cucina Bianca food products local to the Arroscia valley.